Dog Cache Cushion by Mud River. $35.95. "It is his "place" next to my chair." This is the second of these cushions I have bought for my dog. It is his "place" next to my chair. "Puppy loves it. He keeps his toys on it." Puppy loves it. He keeps his toys on it. I think it's still on backorder, haven't received it yet but I have seen ones like it and they're awesome. Should do the trick. Easily transportable. This is great. It's being used for our new pup to learn where to lay down in our home. Great for puppy training to have its place inside! Great quality, my lab is just a pup so we will see how it holds up, but so far great product. "It is also very portable and easy to take with you wherever you're headed." I wish it washed better. After machine washing the mat for my puppy the padding all bunched up into one corner of the mat. It still works and my dog still likes it. It is also very portable and easy to take with you wherever you're headed. The backside of cushion is not waxed canvas like it says in the description. Other than that it meets all expectations. Picture is very misleading. 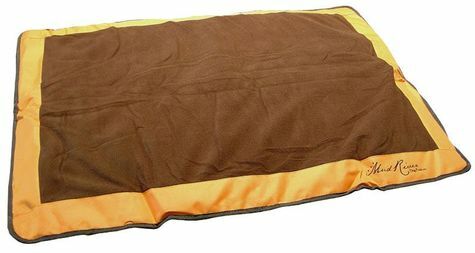 A fleece blanket is thicker than the cushion, it is more of a thin liner. The only thing I will say is it built well as are most of mud river products, it is just very thin. Because of its innovative, compact design, the Cache Cushion from Mud River Dog Products can easily be stored in your vehicle for travel or everyday use. The outer edges are made of 600D nylon, and the water resistant PVC bottom will keep the pad dry and easy to clean. For extra comfort, the center features 200 weight double sided fleece. 2 large Velcro straps secure the pad when rolled for easy storage or transport. 1 year manufacturer's warranty.